When the ants have been chilled until all motion has stopped, introduce one into the colony. See how the ants react to it. (most of the time they will be indifferent until it starts moving again) Once it does start moving, watch the ants reaction carefully. If they attack, remove the ant immediately. Otherwise, watch the foreign worker to make sure it is fully accepted. 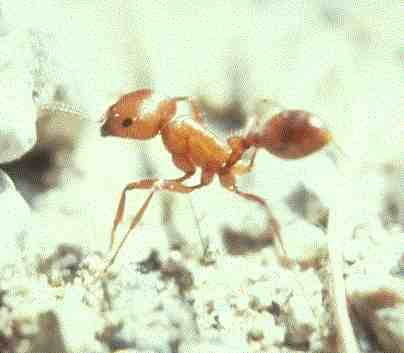 Then intorduce the remaining ants (chill them again if they've woken up) and watch them. They should react the same to the others as to the singel foreign worker. If not, take them out immediately to avoid a war. This works best when you keep the number of ants introduced to about 15 at a time. I use this with my new queens to give them a boost. I introduce about 5 workers and some brood, and that usually gets the colony off to a good start. Oh, I think this goes without saying but, the workers need to be the same species as the colony they are being introduced to. I don't know about others. If you're willing to experiment, post your results here. This sort of reminds me of one way they introduce a new queen to a Honey Bee colony. The new queen is put into what I believe to be a wax cage. By the time the workers chew through to her they all smell the same. Maybe this happens with the cold ants. Their odor is suppressed by the cold and the others slowly adjust as they defrost. I don't know for sure though. It's probably something like that. Unfortunately, my facilities aren't advanced enough to do any in-depth studies on it. (Nor or my skills with ants, other than raising them.) I'm glad SOMEONE showed interest in this, because it's been all I;ve thought about for the past 6 months. Well, I'm definitely interested in that, as well. I have heardf of the bee thing, which is an ingenius way to introduce a new queen to a beehive, but the ant thing.....and freezing you say? VERY interesting. Keep it up, Chris, and take your data well. If it's not in the litereature, it may still be worth reporting, regardless of how crude your faciolities are (as long as you faithfully keep track of eveything and present it well). Are you marking the introduced workers? Perhaps if you did that, you can track the workers over a long period of time to see if they start making scent again, just much later. Maybe cold shock damage is destroying the gland that produces their odor, making them essentially "scentless". The questions abound on this matter. Whatever you do, do it some more!!! This method is very intresting! It seems that you've found the way to "wash away" the colony scent from an ant... I'll try to repeat your experiment with some colonies at the University! I'll tell you something about it! I plan to try this method with fire ants but not with freezing but with starting multiple queen colonies from scratch. I hope thatthey don't check bags when going and coming from alabama cause I plan to collect many species during my stay. chris! !have you changed our screen name or something? instant message me some time. Nah..it's the same. You're just never on anymore (zerogravitation)But, If I see you on I'll IM you. (Or e-amil me a time) I plan to begin more advanced experiments with queenless colonies. The problem with marking is that ants are so clean, and groom so often that they often either lick or brush the mark off. (I've been using white-out and paint) That's why I try to keep it to a small number. Although, I recently introduced a new queen (camponotus americanus) to an existing queenless colony with around 150 workers successfully. I'm not sure exactly what freezing does, but I'm workin my best to find out. Return to The Ant Farm .